In the current world, you do not have to search deep for finding proof that internet is having notable effect on our society! You can just go to the nearest town and observe the presence of the website URL, probably in the banner board. The reason is also quite simple that, it literally takes no time to build your own website. Why should a small business hesitate to build one website, especially when they could build an effective website without spending much money, in order to publicize information about their company in a global aspect? It’s really easy to create a website and it literally takes no time to build your own website. Obviously, no one needs expertise in coding skills because of the rise of content management systems as well as site-builders, which do allow every basic internet user to build his own website or blog in negligible time. However, just like all other sections, the presence of multiple choices for building websites, as mentioned earlier, is becoming a big problem when you have to build one effective website for your small business, through which you would like to mark your company’s presence on world-wide web as well. Despite the fact that there is some pre-development confusion, such as choosing web host and domain registrar etc, the big problem comes when you are stuck among HTML and CMS that are traditional and recently introduced ways of building websites and blogs respectively. As you may have heard about, both these options have their own advantages and disadvantages. 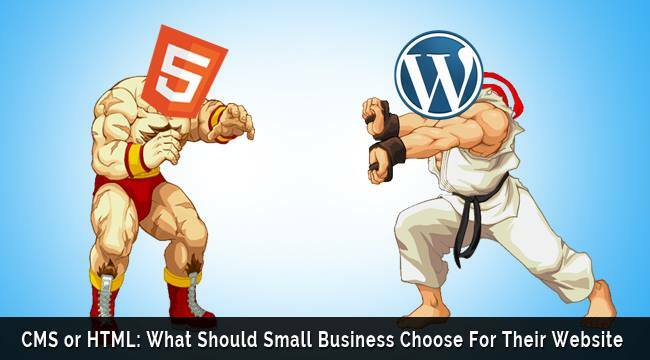 Here, we are about to compare HTML coding and CMS-based development of your website building process for knowing which one of them are apt for you when building a website for your small business! Of course, we will be exploring the various sections of developing a website for reaching an impartial but justifiable choice. In this globe, most people are running out of time! If you are such a person, you may not get time for approaching a developer, telling him to design the website, selecting the suitable design accordingly to your mindset, and at last paying him. In that sense, creating a website for your business has to be less time-consuming. As you might know, when compared to the process of hard coding your website, using HTML as well as CSS and JS, it is a truly simple process of building a website using popular CMSs such as WordPress and Joomla. It takes merely minutes for building your website or blog and then to update it with rich media content, including videos, images and texts as well as dynamic widgets, which might be having connection with other networks and hence increasing the interaction with website. Furthermore, in the case of best hosting providers, such as HostGator, you can skip the bit tiresome of installation process as well because such devices do come with one-second installation packages for popular and useful Content Management system. 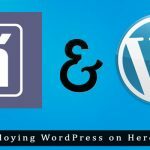 In addition, when talking about CMSs, we should not forget to mention the case of WordPress, which is a truly popular blogging platform and extremely powerful content management system. Hence, apparently, the process of building your company’s website by means of CMSs is an easier job, indeed. On the other hand, when it comes to pure HTML Coding, it seriously takes some effort from the user of web designer because there are no ‘Add’ buttons for inserting media but you have to do it using HTML codes! Despite the fact that HTML has support on all web servers, you use; you have to code everything, arrange your media in proper directories, and to upload the website into servers. So, the process is something time-consuming, indeed. It obviously proves that the process of web building in HTML is a bit tedious task for a newbie web user or developer. Furthermore, we should also consider the simplicity in updating your website via CMS because it takes only minutes for you to add a new piece of information to a CMS-powered website whereas you should play with code in the HTML-powered one. Thus, you should surely go for content management systems if you do not want to spend that much time in setting up and updating your site. Sometimes at least, you might want to customize your website for moulding it for multiple purposes. In that sense, you should have complete control over your website for the sake of customization in a whole manner. As you might know, through CMS, we are not directly interacting with the web-server because CMS is working as a mediator. Hence, not much customization is possible if you are using CMS for managing your website, as you are doing things in an already-prepared platform. Otherwise, you will have to spend a lot time in customizing the code of the whole theme as well as redefining things from the beginning itself. In spite of the fact that there are some plugins for customizing your site, available for CMSs like WordPress, it is not good choice to opt content management systems if you love customizing your business website. Earlier, we said that you have to keep all things in your website all by yourself. The statement indirectly means your freedom to do make ‘ANY’ changes in your site, which in turn lets you to add suitable graphics, media and other stuff by using supportive features as CSS and JS. Also, it is possible to install CMSs in specific file directories if you want the process of updating to be simple. So, it is a good decision to choose HTML coding if you want to customize your site in a higher degree. Thus, it makes sense to choose HTML if you intend to keep things updated but after customizing things. Nevertheless, we hope that you do not need that much customization in the website of your small business venture. We hope you to be well-known about the significance of SEO! So, we are not much talking about the advantages side. Nowadays, hundreds of plugins is available for popular CMSs such as WordPress, concerning SEO of your website. Apart from the normal options for setting title and other essential information, you can add various details for increasing search engine visibility and hence making your site popular! So, it is an essential task to manage the SEO-based stuff, especially if you want to attract customers via your website rather than making it a virtual portfolio. SEE ALSO: WordPress SEO: Complete Guide to SEO for WordPress Blogs. Regardless, hard-coded websites put you to a vast sea of SEO-abilities, as you are the king of codes! Via such websites, you can optimize your website in larger manner so that to get maximum response from SERPs and hence making the site a grand success. When compared to the above-mentioned abilities of CMSs, going with HTML is the best option you could do, if you want to attract clients through your website. Viewing all what we said above, there are enough reasons for supporting both CMS and HTML coding. However, as an authority of a small business venture, we expect you to be having less time for customizing your website. If so, you can simply go for CMS-powered web design and avail all other features such as the easier updating process, simplicity of installation, absence of codes etc. On the other hand, when it comes to HTML-coding-powered websites, you have some abilities of customization as well as deep – SEO optimization. Regardless, you have to take decisions with maximum care because it is your site and it is going to establish your venture in World Wide Web. Which one do you prefer between HTML and CMS? Do let us know via comments. I think that the small should use rich semantics html5 tag for their websites for seo reason. whatever reason but SEO plugins are the best & easy way to handle in any causes. html based website is good in the case if you want to include an online platue for apps and other useful things rather than cms,which is opmtimized to theoritical basis. The author should really do more research and proofread his work. Using SEO as a criteria for comparing Hard-coded v. CMS approaches to site development makes as much sense as asking which approach will bring more visitors to your site. How you build your site – the tools you use, not the architecture – has no effect on SEO. For me, CMS. Because it’s easy and convenient. Also user friendly compared to HTML. Especially for non-techies like me. I have noticed that the WordPress-based websites tend to rank higher in the search engines. This search engine optimization boost for WordPress could happen because of their coding and the lightning fast loading speed, I guess. I tried Joomla a while ago and it was much slower than WordPress. I strongly prefer to use CMS for small businesses to design a valuable website with easy navigation and user-friendliness. WordPress is one of the best CMS platform which you can used to develop a reliable website. I would any day go for CMS. Definitely for a small business, it should be the CMS. What I liked about the post is that it highlights both the advantages and disadvantages evenly. Keep posting such useful articles.